Snorkeling in Key West is one of the best experiences a diver can have. The region provides the opportunity to see an abundance of interesting fish species, including the Scrawled Cowfish (Acanthostracion quadricornis). The scrawled cowfish is sometimes referred to in the Caribbean as the cowfish, trunkfish, or shellfish. 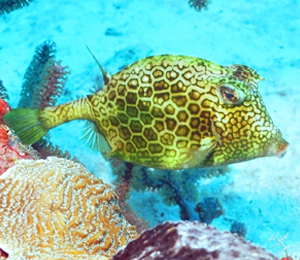 Although the fish has been reported to grow up to 22 inches in length, the scrawled cowfish you will see while snorkeling through Key West are generally around 8 inches long. The scrawled cowfish hangs out in shallow waters, especially where sea grass beds are present. The species has a coloration that differs from gray and brown to yellow and green. The cowfish has dark blotches covering most of its body, along with a few bluish stripes that run parallel to its cheeks. The fish is distinguished, however, by the two spines that sprout from its forehead. The appendages resemble cow’s horns, which is why the fish earned its name. The fish’s mouth has thick, protruding lips. The cowfish’s body is augmented by a “carapace.” A carapace is skin plates that fuse together around the body of a fish, crustacean, or insect. The carapace offers the cowfish a more robust frame and provides additional protection from predators. A second pair of spines extends from the rear of the carapace, giving the fish four cow horns in total.